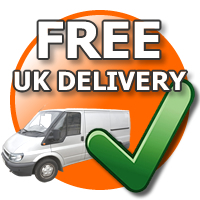 Thunder Pack offers free delivery within the UK on all products on our website. All orders are sent via DHL Express. For delivery you are required to submit a physical address as we don’t ship to a P.O. Box address. At Thunder Pack we understand that you need your goods as soon as possible. This is why we put great focus on our shipping speed. Once you have placed an order we usually ship the next working. Please allow up to 2-3 working days for delivery. With customer satisfaction as our highest priority, we emphasize on the efficiency of our delivery service, providing your goods to your chosen delivery address. We process orders throughout the day and your order will be dispatched directly from our supply division. Your order will be dispatched using the best and most appropriate packaging to ensure it arrives to you in safely in a flawless condition. For international shipping (outside the United Kingdom) orders please email us for a delivery quote before purchasing. We accept all major credit cards as well as debit cards. Please check your shipping and billing information carefully when checking out to avoid delays in delivery. Once you have placed the order by making the payment from the check out page, you will be sent a confirmation email.